As you can see, I'm using 0.7 mm lead. 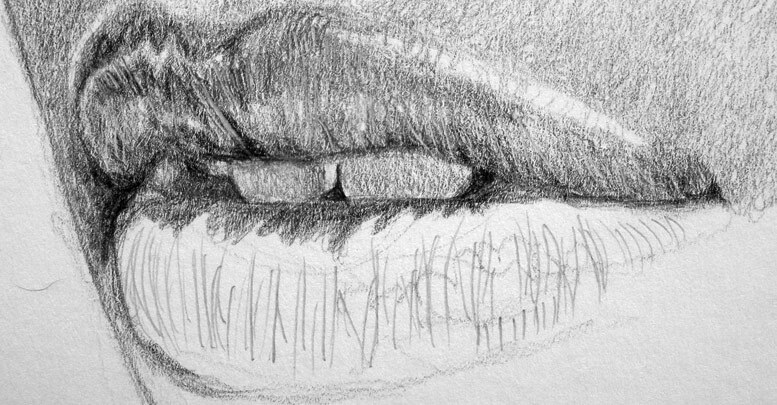 I will also use a 4H, HB (#2) pencil and a Kneaded eraser (also known as putty rubber) for picking up graphite particles. These tools will give you precise control over what you draw. Photorealism evolved from Pop Art in the 1960's. It was a reaction against the ubiquitous use of photography in media and abstract expressionism in art. I happen to enjoy both realistic and abstract art and don't see a reason to compare. Everything is cool on some level, I suppose. The one thing realism is particularly good at is reaching a broad audience with the clear message: nature is beautiful. In photography, even a tragic image can be breathtakingly beautiful. 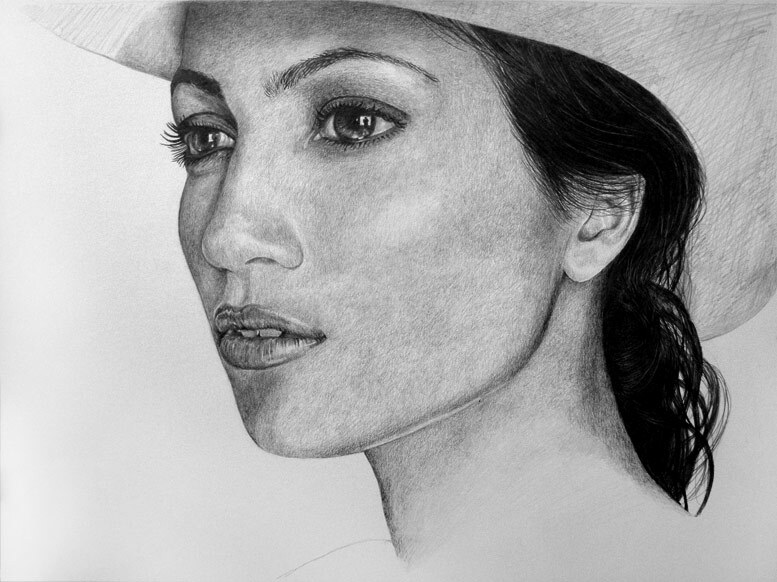 In photorealistic art, sometimes the same can be achieved, but with an extra human dimension. With this in mind, always strive for a little tension and conflict. You can save all the drama for your momma, but in art, go ahead, pour everything out --and in the end perhaps you'll capture something ineffable or at least your very best. 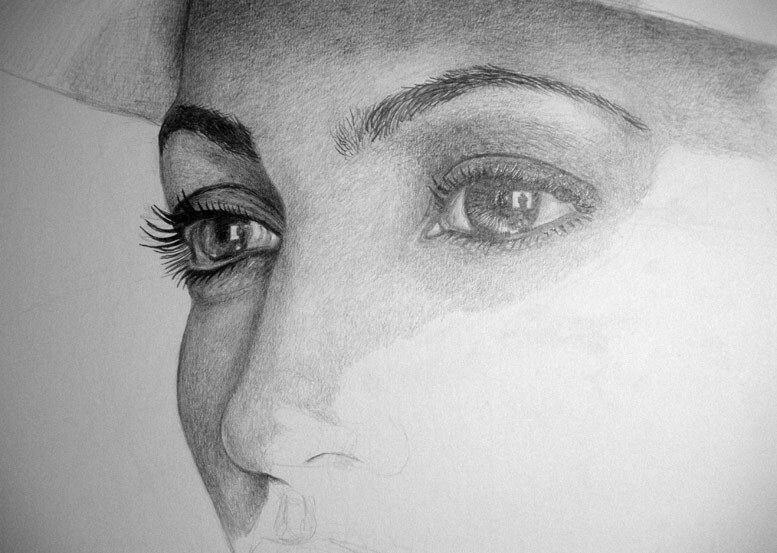 The human face is probably the most difficult subject to render accurately. It takes years of practice to develop the skills needed to capture proportions and subtle features that make for a convincing resemblance of a person. If you're not a portrait artist, you can still use these techniques to draw other subject matter. A piece of machinery or tree trunk or still-life of any kind can be a beautiful and impressive work of art. If you are under the impression that you have little artistic talent, you may want to try a simple exercise to shift your consciousness to the right side of your brain. Take a photograph and turn it upside down. Then try to draw it. You may be surprised at how well you draw. However, an artist doesn't necessarily have to be 'right brained.' You also don't need to be left-handed (I'm right handed). Once you have a photo that want to work from, you'll have to transfer the drawing to paper. If you have years of experience in drawing, you'll be able to render proportions accordingly. However, if proportions are not your strong suit, I recommend that you download a drawing grid app to your phone. You'll be able to divide the photo up into squares and then lightly draw corresponding squares on your sheet of paper. Working on one square at a time, you can better get your proportions to be accurate. Remember, this is not a classical drawing. You'll have to betray all your artistic notions about the creative method. 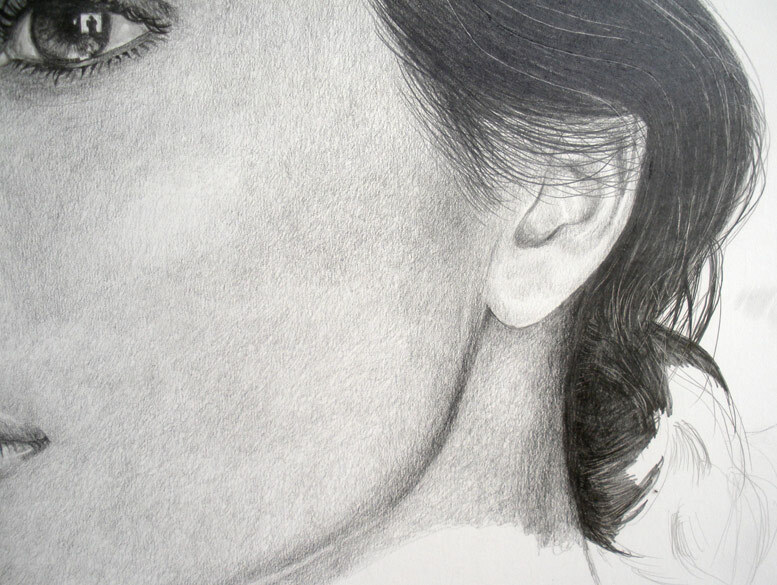 Instead of organically building the composition up as a whole, photorealism requires that you work mechanically, This early stage of the drawing is the closest you'll come to a melodic artful approach. It may even look like a gesture drawing, loose scribbles, until something forms and emerges from the chaos. As you activate the plane with energy, use this time to express movement and emotion. 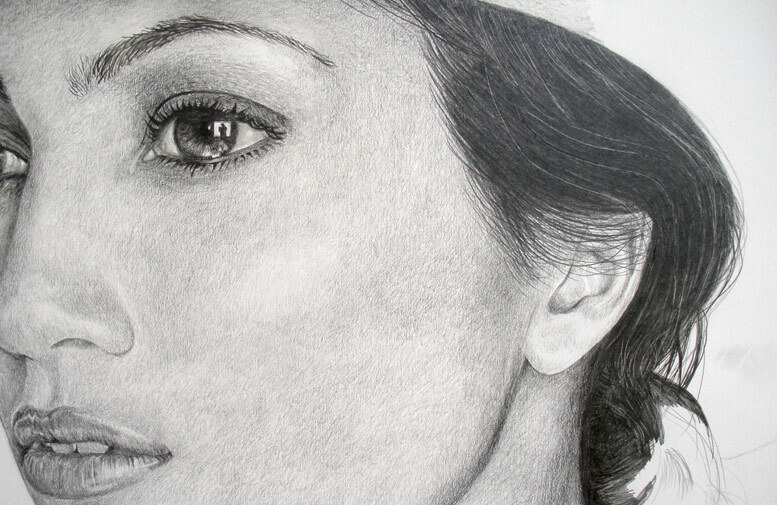 Once you've made the drawing of the face, you've essentially completed the portrait. If you wanted to, you could frame it and invite others to appreciate the weight and linear continuity of the composition. It might not look out of place in a museum of modern art hanging next to a drawing by Alberto Giacometti. So feel free to admire it for a while, appreciating all the interesting lines and what might look like accidental or random marks. All right, this is a photorealism tutorial after all. Let's get to it. 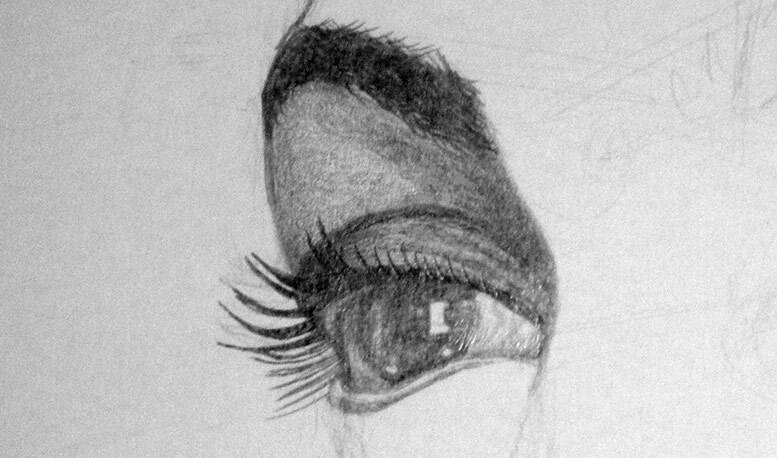 Here's a close up of the right eye (image below). It's been said before that art is a discipline of awareness. 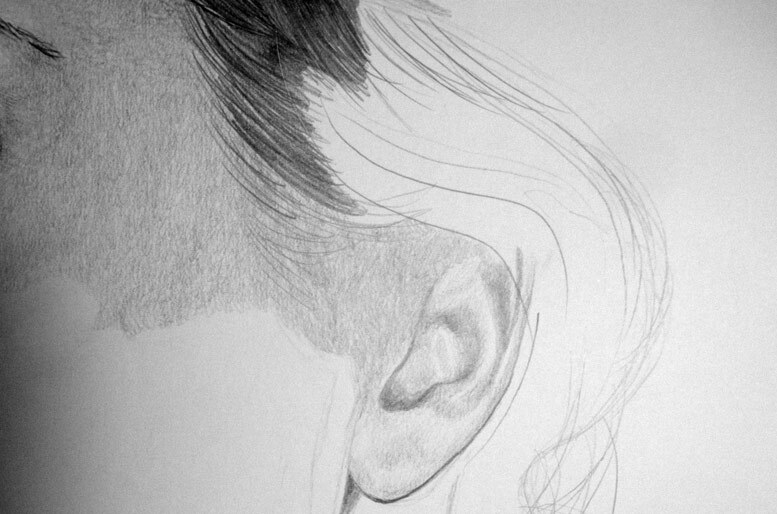 The most important activity that we'll be involved in for the rest of the drawing is observation. To put it simply, notice, notice, notice, interesting shapes. The more interesting the shapes seem, the more you may want to exaggerate slightly so others will notice them. It may seem silly, but the greatest joy in drawing can be falling in love with shapes. Shapes are formed by positive and negative space. Tiny details are like hidden treasures that you look for and find, drawing circles around them like word search puzzles. 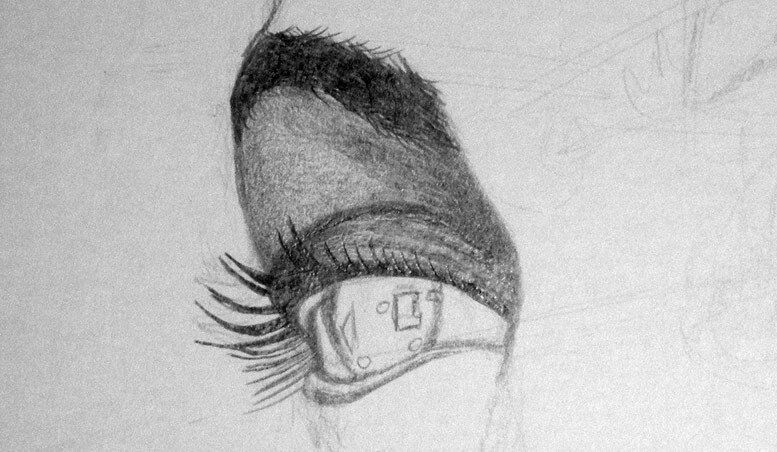 Below, I start off with an exquisite find: a rectangle and a couple of lines within the iris. 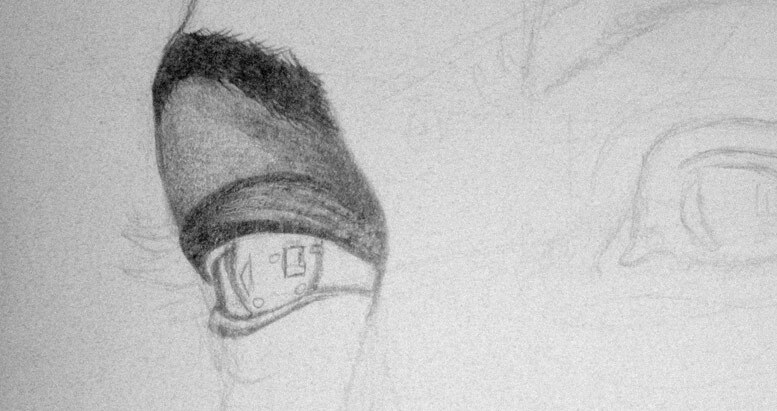 Also notice that I've begun using the mechanical pencil for darker lines. Here are some cross-hatch lines to create the eyebrow (below). 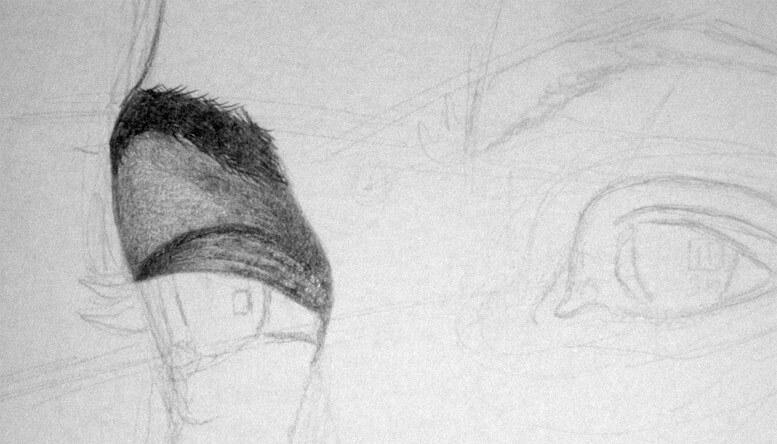 I'm shining a bright lamp on the drawing so you can see the direction the lines are going --so there is some glare. Now listen very carefully Baby Puppy. You're about to perform a magic trick. Take the 4H pencil, which is a hard lead, and draw some lines with firm pressure. You'll be pushing hard enough to actually dig grooves into the paper. 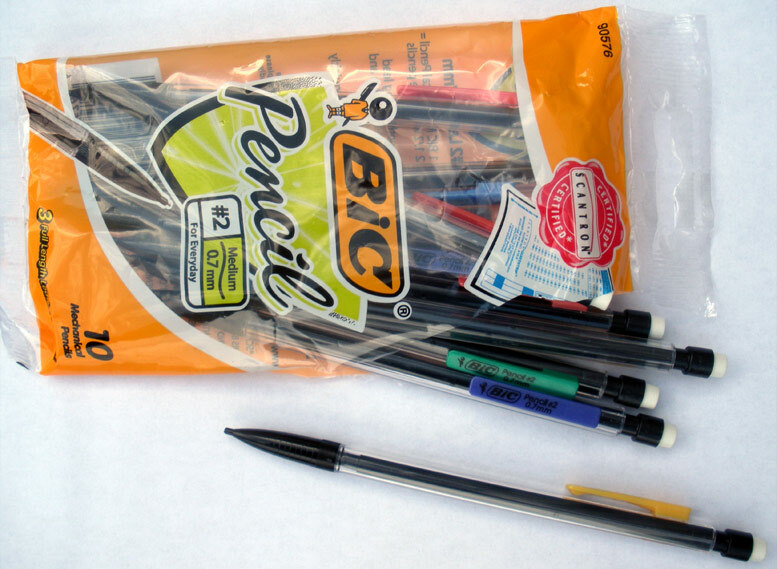 These will serve to create lighter areas that the dark mechanical pencil lead will not be able to penetrate. This effect will be similar to the negative space in fingerprints..
Now for the graphite technique you'll be using most in this drawing. 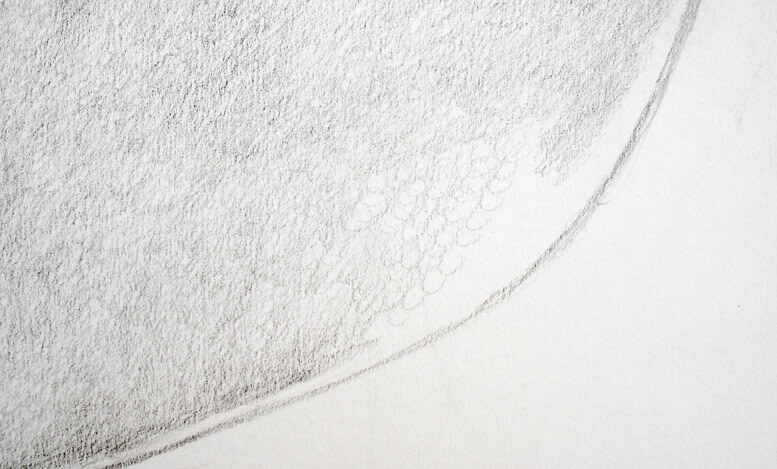 With a slightly worn mechanical pencil lead (just scribble on something for a moment), use the dullest part of the point to shade with tiny ovals. The ovals should be built up gradually, so that the shading goes from light to dark like a photograph developing in a dark room over time. Go slow, be patient. 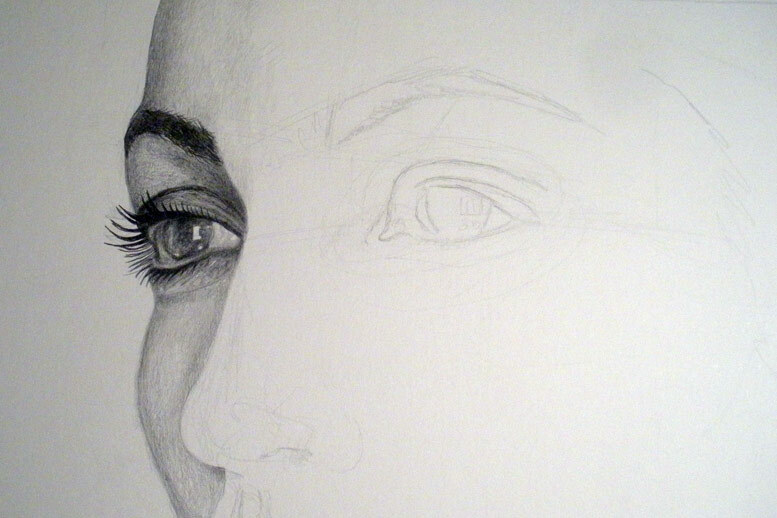 Use the grain of the paper to aid you in creating the illusion of skin texture. You have to decide when you've reached a shade that makes the best use of the paper texture and the graphite technique. As you shade over the eyelid, you'll notice the grooves that you've created with the 4H will now begin to stand out (see below). 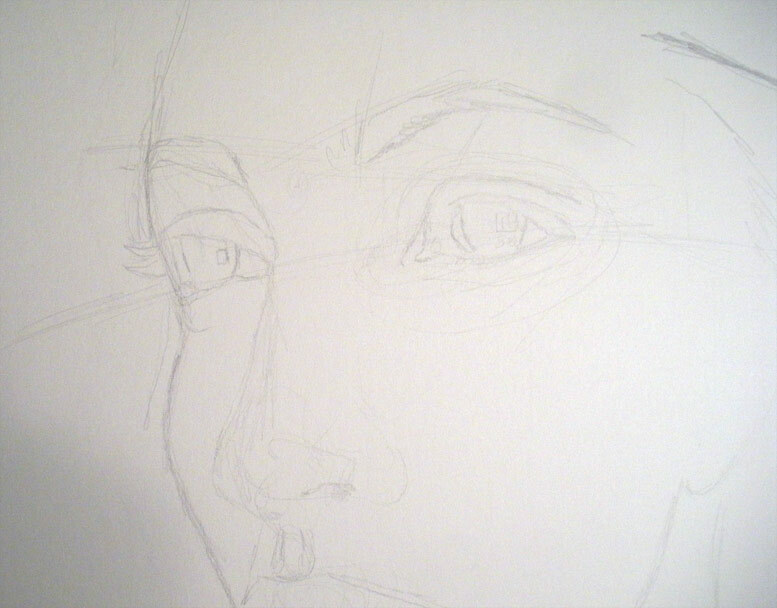 These are the beginnings of wrinkles that you'll soften and add more detail to later. The skin around the eyelid is extremely soft and thin. With a youthful looking person, the eyelid wrinkles don't usually make the person look old. 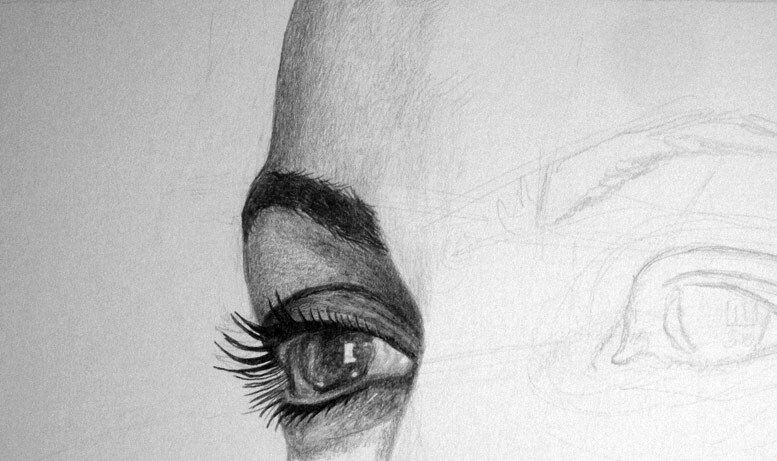 Most people are accustomed to seeing wrinkly eyelids, and won't question your rendering of wrinkles.. Since she is wearing a hat, it will creates shadows on the forehead. 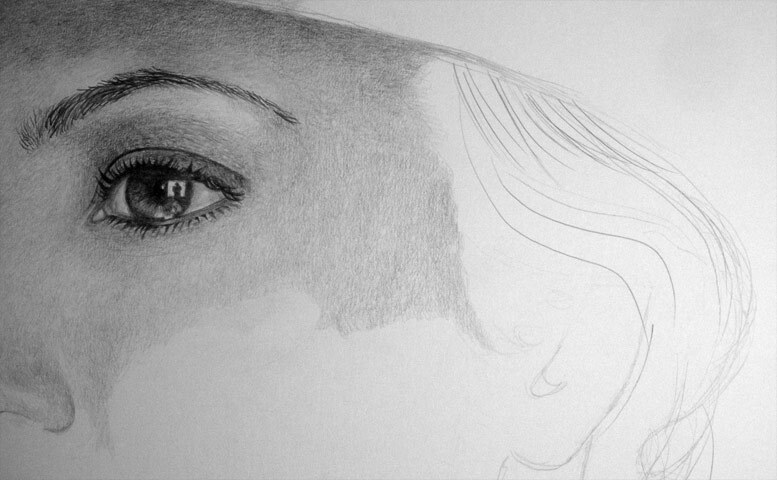 Take your time and make gradual transitions from dark to light with your shading. Since I'm right handed, I'll be drawing generally from upper-left to lower-right. If you're left handed, you'll do the opposite. The lamp I'm using will be on my left so that my hand doesn't create a shadow over the area I'm trying to draw. In this photograph the light source is different only for the sake of the camera. 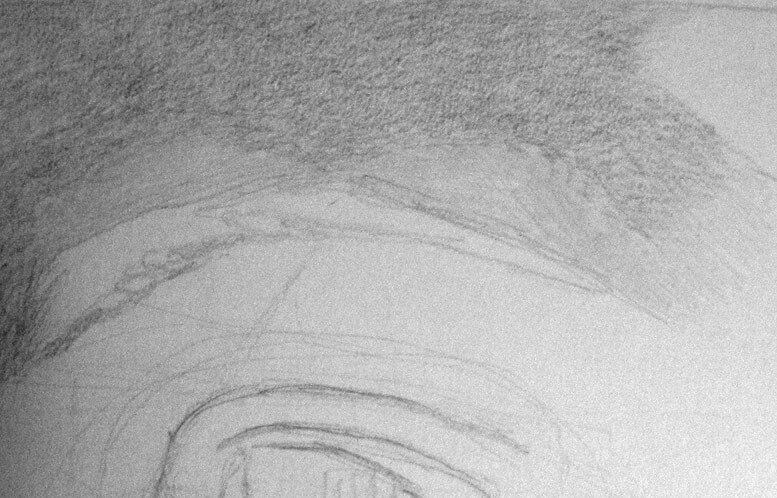 Although the shading in the forehead is finished (below), I will go back later and even out the spotty areas with the kneaded eraser, redrawing some parts if I erase too much. 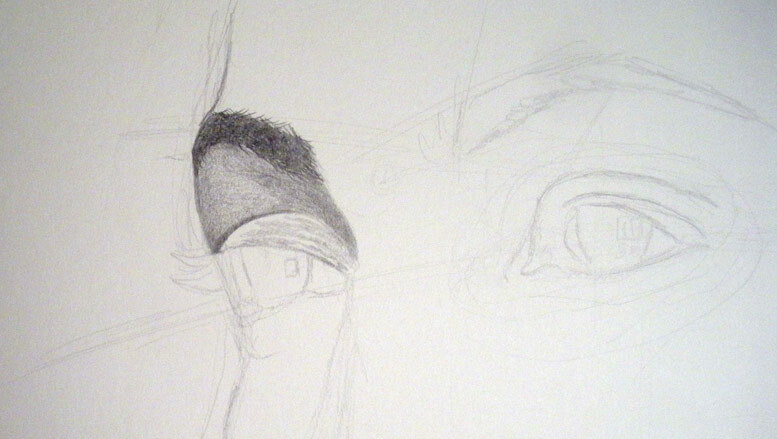 I've shaded enough to draw the left eyebrow with firm pressure (with the mechanical pencil). Do not draw the hairs over white paper. Make sure you've shaded underneath first. 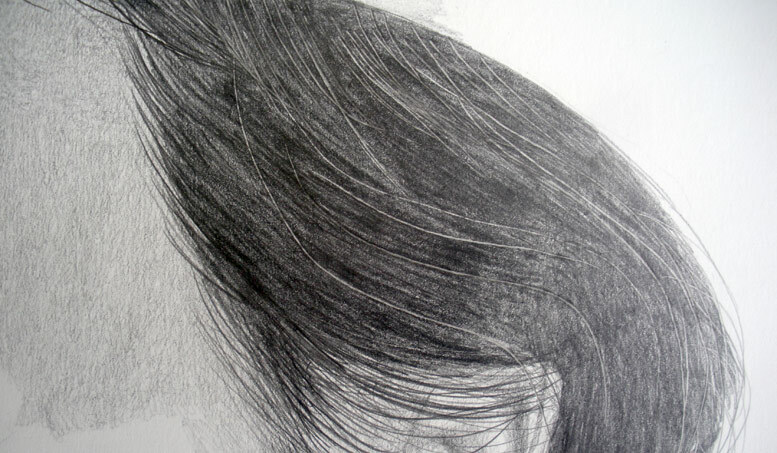 Take your time and draw each hair with great care (hey that rhymes!). This part of the face is reflecting light,so you are trying to simulate a complex effect, a highlight on porous skin with tiny wrinkles. Use the grain of the paper, the pencil graphite and the kneaded eraser (all working together) to render this until you're satisfied with the result. 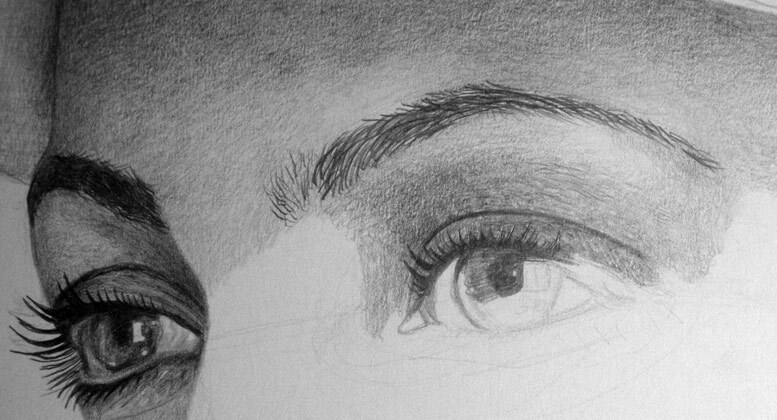 I've create a highlight on the cheek with very light shading transitioning out into darker shading with the mechanical pencil. Here's a close-up of the mouth. I've turned up the contrast so you can better see the lines and shading. Notice there are no straight lines in nature. All contours are melodic. Try to imagine these shapes as islands on the horizon. Squint your eyes and see an archipelago in the pacific. Here's an even closer view of the detail (below). 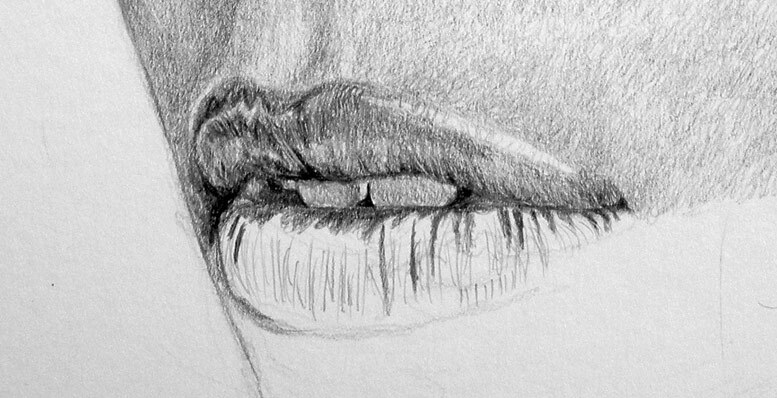 Shading the lower lip (below). 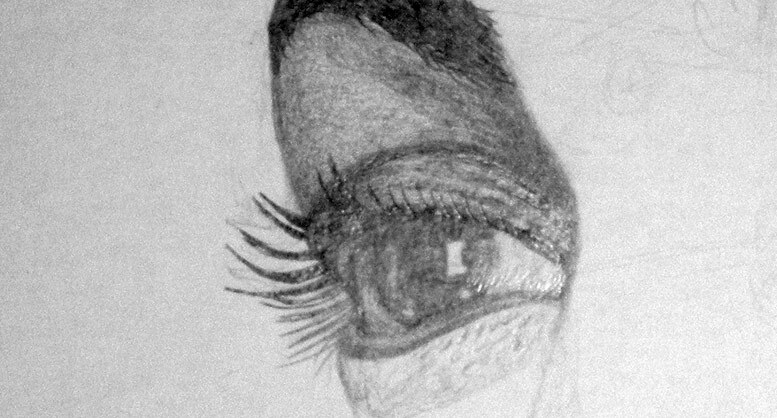 Here's an extreme close-up (below) so you can better see the graphite oval technique. The hair is almost finished. Closer view of the hair (below). How long did it take to draw this face? If I add up the hours, perhaps one full day. If you liked this tutorial or would like to share anything you've done, you can find me on facebook. Please watch my YouTube video below.